January 23, 2019 January 23, 2019 Daniel Birdsall 170 Views Cool stuff! If you’re a regular visitor to our website, you’ll notice something different today, namely EVERYTHING. We’re live with our new site! My guess is that many readers have some experience with large-scale web migrations, and so appreciate the immensity of this type of project. I knew in the abstract that a full site rebuild was a big undertaking, but even in my tangentially-involved capacity I’ve been regularly awed at the scope of this effort. It’s a process that’s covered nearly two years from the earliest planning stages, and we’re grateful for the tireless efforts of many of our Fletcher and Tufts colleagues, particularly our friends at Fletcher’s Communications, Public Relations, and Marketing office who have managed every step of the migration (and politely listened to endless demands suggestions from our team). But enough with our internal backslapping. What does this mean for you, readers? Let’s be honest, in the first moments upon arriving at a wholly-redesigned site that used to feel familiar, many of us sigh and think “great, now I can’t find anything,” no matter how it looks. Our hope is obviously that this feeling will pass pretty quickly for you in this case. Poke around a bit and you’ll see that all our content is still there. Give it a few more minutes and you should begin to notice that the navigation is considerably less dense, and the organization a bit more intuitive. 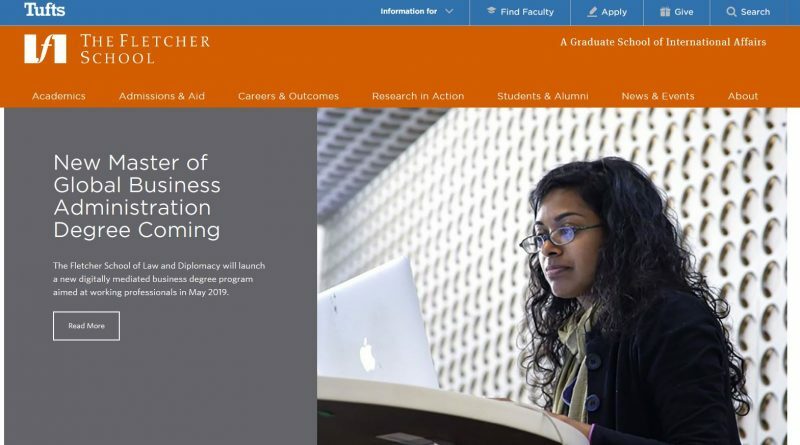 There are a number of new features worth calling out, too, including a searchable faculty database, expanded career stats and career planning content, and site-wide mobile-responsiveness that will make a much friendlier browsing experience for those of you who primarily use mobile devices. Websites are never “done,” though, and you can expect further updates, fine-tuning, and new features over the coming months. You can check out this brief tour of the new site for an overview. As always, the Admissions team is available to answer questions and direct you to whatever resources you may need. Whether you’re in the early stages of researching Fletcher, or planning to submit your application for one of our upcoming February 10, March 1, or April 1 deadlines, we hope you’ll find the new site helpful, informative, and easy to use!